Samsung sent out invites for its press event tomorrow in New York. Looking at the invite below, we can safely assume part of the conference will be dedicated to the Gear Fit 2 and Gear IconX Bluetooth earbuds. 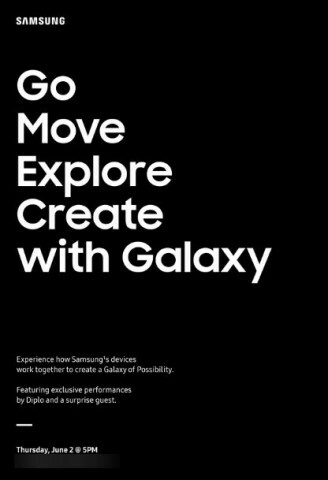 We’re a bit puzzled by the “Create with Galaxy” part. Since it’s a bit early for the Galaxy Note 6 to launch, we’re inclined to think Samsung will unveil a tablet. The Samsung Gear Fit 2 is said to come with a 1.55-inch Super AMOLED display, with a resolution of 216 x 432 pixels – quite detailed for the size. Under the hood is a Samsung 1GHz dual-core processor, backed up by 512MB of RAM and 2GB of onboard storage, all powered by a 200 mAh battery. Expect more information on what Samsung is cooking up for tomorrow as the event unfolds.